From the kitchen of One Perfect Bite...What do you have for dinner after a day of hiking in paradise? Ever the contrarian, I settled on a dish called Uova in Purgatorio, or Eggs in Purgatory. This remarkably versatile Neopolitan dish is the poor man's version of Eggs Benedict. It consists of eggs that are "poached" or baked in a spicy tomato sauce and then spooned over a base that is limited only by the imagination of the cook. I was particularly unadventurous tonight and served ours on thick crusty slices of Portuguese bread. Giada De Larentis has a version of the eggs that she serves on mashed potato cake. It sounds wonderful and I'm sure it's delicious, but this is one of my go-to meals for days where the clock has run out and we have yet to eat. The potatoes would edge the dish into a category more substantial that I wanted to deal with. I'll admit it. I settled, but in doing so I kept the focus of the dish of a wonderful puttanesca sauce and perfectly poached or baked eggs. The eggs absorbed the flavor of the sauce as they cook, so what would seem to be a bland choice for a meal actually becomes something that can excite the palate. While I love this dish made with puttanesca sauce, any good tomato sauce, even the kind that comes in a jar, can be used without compromising your results. This, by the way, is a wonderful choice for a brunch. It can be assembled the night before it's needed and baked off just before serving. Here's a recipe that would make even Dante happy. 1) To make Puttanesca sauce: Heat 2 tablespoons olive oil in a large skillet set over medium heat. Add garlic, pepper flakes and anchovies to pan and cook just until garlic is fragrant. Stir in tomatoes and simmer for 10 minutes. Add capers, olives and parsley and heat to warm through. Season to taste with salt and pepper. 2) Meanwhile, preheat oven to 375 degrees F. Transfer sauce to a baking pan large enough to hold whatever number of eggs you are using. Crack eggs onto surface of sauce, keeping the eggs yolks intact. Whites may overlap but that's fine. Bake uncovered for 12-15 minutes, until whites are set and yolks are still a bit runny. Add bread to oven about five minutes before eggs finish cooking. Serve eggs over toast and sprinkle lightly with Parmesan cheese. Drizzlw with olive oil and serve hot. Yield: 4 to 8 servings. I LOVE the picture of the eggs! And the kids! A VERY popular dish down here on the southern coastline & New Orleans, very similar only it's done in a cast iron skillet! It looks beautiful and sounds wonderful. Have a great week! What a great picture and interesting recipe. I've never had it but am extremely intrigued. Thanks for sharing! These look good -- I've never fixed them before and I think they may be supper one night this week. The eggs dish is nicely done! yummy! I wish I could get Hubby to even TRY this kind of dish (I think he would rather have an arm cut off) but it looks delicious to me. I think I'll put it on the list of "fun foods" for the next time Hubby goes out of town. The little boys are just precious!!! I would never have thought of preparing eggs this way, Mary. Thanks for the tip. Happy Blue Monday. This looks great. I love eggs any way you cann imagine to cook them. I also use Puttanesca sauce as a standby whenever I need something easy and yummy! Glad you had a good time hiking! The eggs looks really good! Ande the boys are lovely! The eggs look pretty wonderful too. 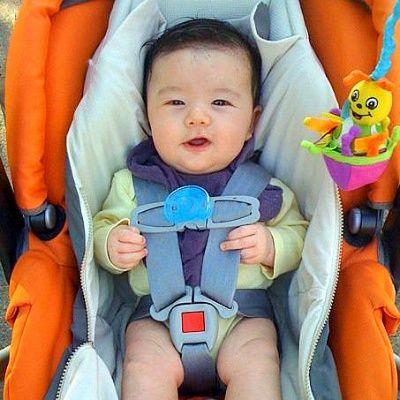 OMG, your youngest grandson is getting active! 3 months old, right? How adorable both of them. They look very alike, don't they! Btw, your eggs in purgatory looks as wonderful too! Thanks so much for sharing those beautiful photos. Is he your grandson? He is so cute! That is such a beautiful photo... and the idea of the sauce ooozing over the bread... what a great post! Your eggs look fabulous! What beautiful children! Happy Blue Monday! Your recipe for "eggs in purgatory" gave me a really good laugh this morning. When I was a child, my great uncle from Ohio did this type of eggs over toast for us when we visited. I loved them. So, I thought to prepare the dish for my little boys. One would have thought I was trying to poison them! They talk about it to this day (they are adults) and shudder with distaste! Did I mention that Uncle Bob's sauce was ketsup? So was mine! So, on their next visit, I'm using your sauce recipe and see how it goes. In the meantime, my husband and I will enjoy it! I have always loved that name and yet never made them. What a great recipe!!! Should be eggs in heaven!! Mary, I'm bookmarking this recipe. It's just my style. Somehow I must have missed Giada serving these eggs on mashed potato cakes. That sounds so good. We love any excuse to serve potatoes. Just blame it on Giada, right? However, the bread sounds perfect for a day when you come home tired. And so much easier too. Your men in blue are darling. Have a great blue Monday. I've never had an egg dish like that but I bet it's great! The eggs look good enough to eat right off the screen and those boys are just too cute. A so good-looking dish with so inappropriate name. Looks really tasty. OH my goodness! Now this dish would certainly be an eye opener in the morning! A very nice recipe Mary. I'll try it for brunch some time. Have a nice day. Michael. Yes this is a beautiful recipe and beautiful photo's of the recipe and the boys, (they are getting so big). I have made this before with a marinara, however your puttanesca sauce sounds fabulous. Thanks for the must make it! 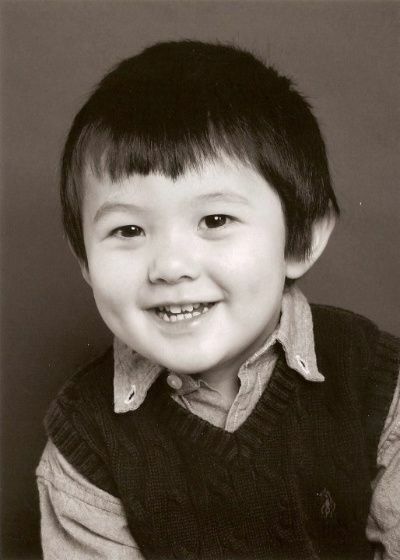 the boy is very cute!! and lovely egg dish! I love the name of the dish! Looks super. Wow love all pics looks pretty...Happy blue Monday. I love the name of this recipe! 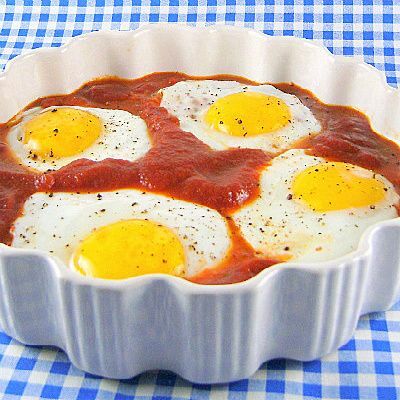 We often make fried eggs in tomato sauce, but I really like the idea of making them "en cocotte". The pictures look great! Great looking dish and one I think I would really love. Love those eggs. That sounds so good, I wish I could convince my girlfriend to try eggs and red sauce. I'll just have to make it for myself. Heh. And that's one h***uva n'egg recipe! Thanks for stopping by and visiting me. I wanted to come and check you out. Your pictures are so beautiful! So many tasty things to try here. Lovely pics..of kids and eggs :D I will love this for sure, since I love eggs..have a great week Mary ! Such a great way to make eggs! I really want to try it. The name itself is just full of intrigue! I want a huge loaf of bread to soak up that sauce! Looks delicious. And those kids are such cuties! Sounds like a delicious dish. I've never heard of this one, but will give it a try. Thanks for the recipe. Hey Mary, Eggs in Purgatory sound and look delicious. That little boy is a looker too-very adorable. New to me, but very interesting. I started the habit of have having one evening meal during the week where we have eggs. Thank you for adding to my repertoire; looks good...gotta love those boys. Who is that boy? So cute! Anyway, those eggs - are you sure they are eggs in purgatory? They look like eggs from heaven to me! This recipe reminds me of my grandmother and how she used to eat this often for breakfast when I would stay with her and grandpa during the summers. Now as an adult, it looks delicious to me as well. Great photos all around today! This is my idea of a delicious meals, Mary, and I really like the way you've kicked the sauce up a notch with anchovies, capers and olives. I hit "send" before I realized that I didn't tell you how adorable I think your little guys are. Too gosh darn sweet for words. Mmmm....Mary we love our eggs cooked this way and served over a nice big slice of toasted Italain bread. Your grandson is adorable ..what a cute smile! Awww the kids outshine the eggs :) I bet the eggs are good too but those smiles are too precious for words! waw!! What a fabulously looking tasty dish!! I also love your lovely pictures, Mary!! Just so beautiful too! This dish must be so tasty & awesome too! I am very, very intrigued by this dish. Whenever eggs are on sale, DH buys 9 million of them so I'm always on the lookout for new egg recipes. I like the idea of this one since it's not necessarily a "breakfast' dish. will definitely be on my "to make" list. These eggs should be absolved and advanced to heaven, Mary. I would definitely serve them over crusty bread with a nice sprinkling of crushed red pepper! I don't know what is more delicious, the recipe or the boys! Okay, the boys. But the eggs looks awesome too. This brings me back to my Neopolitan mom's cooking! She often used leftover Sunday sauce to make a lunch of poached eggs with a little bracciole or whatever meat was left. The idea of using puttanesca as the base is something I never thought of since mom only made puttanesca for Christmas Eve.